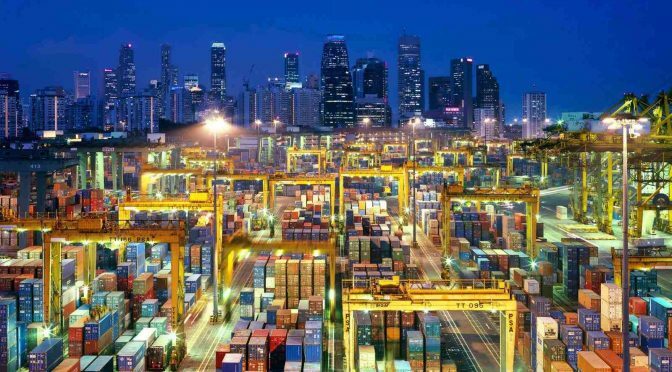 For Singapore’s port, automation is seen to not only strengthen its position as a transshipment hub well into the future, but also helps it keep up with technological developments and industry trends. The shipping industry has generally been slow in adapting new technologies, due to its conservative nature and the large number of players involved. Currently, only a fraction of global container volume is handled by fully automated container terminals. In 2016, it was estimated that only 4-5 percent of container volume will be handled by fully automated terminals once ongoing projects were completed. Nonetheless, industry pressure and competition have heightened the need for ports to invest and automate, indicating that the number of automated terminals will increase. Fully-automated terminals have the advantage of low operating costs and reliable operations, but require higher upfront costs, longer development, offer only low productivity increases at peak times, and have the general difficulty to fully automate a working terminal. On the other hand, semi-automated terminals offer the possibility for greater productivity increases at peak times, are generally understood to have the best overall productivity with less upfront costs, but require higher operating costs and are inconsistent when it comes to handling ULCVs. The shipping industry and ports are seen by many insiders as underprepared for cyber threats. Even though major players in the shipping industry have recognized and acted on the risks posed by cyber threats, the majority have been slow to recognize potential business risks. Even though awareness has grown, the need for better information sharing persists. Automation further increases the exposure and impact of cyber threats for ports, highlighting the importance of data and system integrity. The reality of cyber threats to automated terminals was demonstrated in the “NotPetya” cyber-attack in June 2017. The attack forced Maersk to interrupt operations at multiple terminals worldwide, causing logistical havoc for weeks after the attack. Overall, it cost Maersk roughly US$300 million, even though the attack was not specifically directed at the company. The “lucky hit” against one of the industry leaders showcases that even well-prepared firms can suffer financial losses due to cyber threats. While ports have to secure themselves from a broad range of risks, cybercriminals can choose from a number of entry points. For example, external vendors, terminal operating systems, and unaware employees may be vulnerable to phishing attacks. Operational systems and data networks are not always up-to-date or properly secured, allowing criminals to gain comparatively easy access to information. To prevent the ports and shipping industry from most attacks, regular operating system updates, stronger passwords, secure satellite connections, resilience exercises, information sharing, and employee awareness campaigns should be practiced. Human factors can take the form of criminals, terrorists, competitors, disgruntled employees, and more. Workers at mostly manual terminals, for example, generally do not like automation because it makes their jobs largely redundant. To reduce the chance for cyber threats stemming from or aided by disgruntled employees, ports can offer training and job guarantees to their workforce to make the transition to automation more incremental. In addition, the Liberian ship registry started a computer-based two-hour cybersecurity training program in October 2017, offering a comprehensive overview of cybersecurity issues aboard ships. Nevertheless, it is unlikely that these courses and campaigns are enough to protect the industry. While it is a step in the right direction, more needs to be done through regulations. Since 2016, the International Maritime Organization (IMO) has put forward voluntary guidelines regarding cyber risks. Only after 2021 does the IMO plan to enforce a set of binding regulations on cybersecurity. This might be too late for many companies in the industry. Shipping companies should not wait until 2021, but should begin now to implement simple measures, like using firewalls and stronger passwords, to deter criminals from trying to exploit current weaknesses. Further, even though the IMO adopted guidelines on maritime cyber risk management into the International Safety Management Code this year, ports and the shipping industry still need to establish a stronger culture on cybersecurity.